The award winning movie Bohemian Rhapsody is one of the greatest movies made last year. The movie tells the story of the British band Queen and their charasmatic frontman who died in Protected content , Freddie Mercury. The title of the movie may be one of the greatest singles ever made. 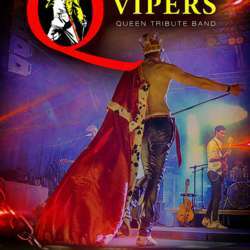 With the success from the movie the only right thing for Baroeg to do was book a Queen tribute band, The Vipers. The Vipers is an Itallian tribute band who play all around the world. The four band members will play one hit after the other so the only thing for you to do is sing- and dance along! Oh and "Don't Stop Me Now" cause "The Show Must Go On"!